City of Vancouver has permitted laneway housing in all single-family neighbourhoods(RS zoning). A number of residents are adding laneway homes to their existing property, while others have decided to build them alongside their new construction. On average, 11 laneway house permits were issued per month during the first 100 laneway homes built in Vancouver, according to a study done by the city. 1645 LWH have been approved and 1147 have been given final inspection as of April 30, 2015. What is a Laneway House? Laneway housing is a detached dwelling on a single-family lot, facing the back laneway where the garage is located. One exterior parking space (minimum) is required on all lots with a laneway home. Houses that already have a secondary suite are still eligible. Note that STRATA TITLING IS NOT PERMITTED, as these dwellings are non-saleable. Why Build a Laneway House? Aging parents: A home in the backyard provides close proximity for parents who are fairly independent but still need some care. This could also be a space for caregivers. Adult children: Instead of moving out entirely, a separate space on the same property provides growing children a cheaper alternative to renting their own place while going to school or starting their career. Extra income: The laneway house can be rented out as an extra income earner. Downsizing: Owners can move into their laneway house and rent out their main residence when downsizing. Building community: Having a home face the back of the property adds liveliness to the back lane, as well as adding the option to plant greenery where there would otherwise be only a garage and concrete. Being green: Adding more housing options on unused space increases housing density and adds an alternative form of rental housing for years to come. 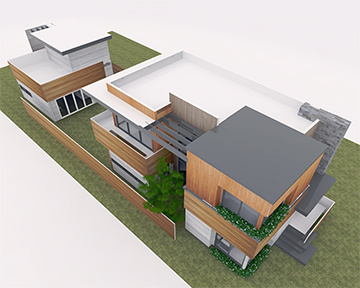 Laneway homes are part of Vancouver’s EcoDensity program and must comply with the new Green Homes Program. Read more about the lot requirements and dimensions for building a laneway house. What are the Requirements for Building a Laneway House? Must have access to an open lane, either directly or on a corner lot, or be located on a double fronting site served by a street on both the front and rear. The lot must be deep enough for the laneway house to extend up to 7.9 metres (26 feet) from the rear property line AND have a minimum separation from the main house of 4.9 metres (16 feet), allowing for open backyard space. There must be a fire access path along one of the side yards. How Big are Laneway Homes? Laneway housing can be built in 1 and 1½ storey configurations. The maximum floor area can be determined by multiplying the lot area by 0.16. On standard 33’ x 122’ lots, this allows a maximum of an approximately 644 square foot home. On a 50’ x 122’ lot, this allows a maximum of approximately 900 square feet. If you choose to build a 1 storey house it is limited to the same maximum height as a garage which ranges from 12ft flat and 15 ft sloped roof. Also they allow you to build 32 feet from the alley instead of 25feet which will give you a larger foot print. There are many other criteria that need to be looked into, like cost, specific lot dimensions, age of the house, house location on the property, and corner lot considerations. If you have questions about your specific property, you can email or call me directly. I look forward to speaking with you about your project. Below is a common lot floor plan for a laneway house.